Herndon, VA – July 2, 2018 – EdgeConneX®, specializing in global data center solutions at the edge of the network, today announces a partnership with Colt Technology Services, a leader in enabling customers’ digital transformation through agile and on-demand, high bandwidth solutions. 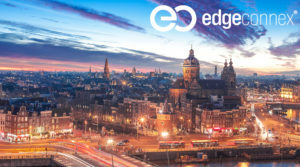 The partnership will see the Colt IQ Network connect into several of EdgeConneX’s facilities, beginning with their Amsterdam Edge Data Center® (EDC). This will enable Colt to address the growing local and global demands for connectivity at the edge. To learn more about Colt, visit www.colt.net. Colt aims to be the leader in enabling customers’ digital transformation through agile and on-demand, high bandwidth solutions. The Colt IQ Network connects 800+ data centres across Europe, Asia and North America’s largest business hubs, with over 26,000 on net buildings and growing.